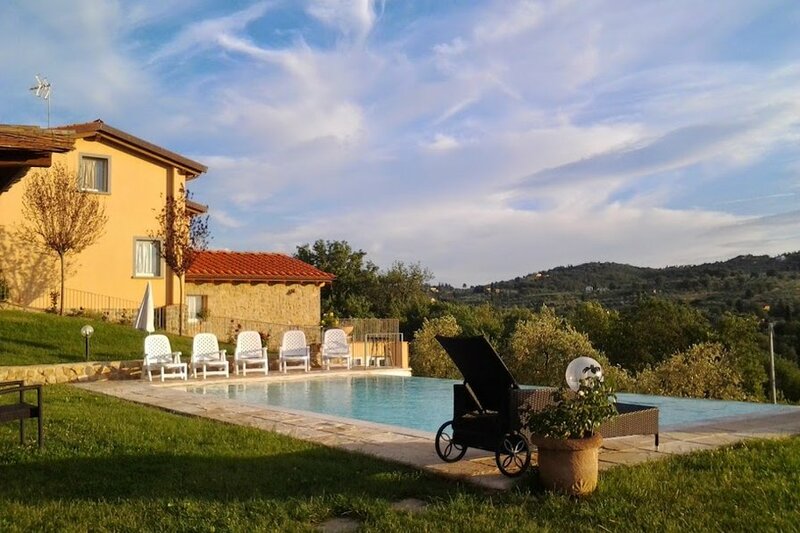 Viilla meraviglia ia a delicious country house with private swimming pool , jacuzzi and a large garden in a panoramic location in the countryside near Arezzo . The property is located inMonte San Savino medieval city of ValdiChiana, a valley well-known for its landscape and its historic small villages. The city of Arezzo is easily reached by car, just 20 kilometres away, Cortona at 25 km and Siena at 40 km. The villa offers a view over the sorrounding countryside and the Gargonza Castle, a medieval village with 13-th century tower, walls and Romanesque church. The most important and distinguished host of the town was Dante Alighieri in 1302, as in the words of the historian Leonardo Bruni in its book "Dante`s life" and as written on the memorial tablet at the entrance to the castle. The closest house is 700 metres away. The villa, located in a very green and quiet location, is sorrounded by a fence to guarantee privacy to its guests. From the swimming pool you can admire the typical Tuscan landscape. Around the estate, there are woods, olive tree groves and vineyards. Inside the property there is a fenced lake with the carpe koi fish. Also 2 small donkey are in the end of garden, very friendly and loved by children. The villa ( 8+4 beds - 4 double bedrooms, 1 bedroom with bunk beds, 1 double sofa-bed in one of the three double bedrooms, 4 bathrooms ) is on three levels. On the first floor, there is a living room, 2 double bedroom, a bathroom, a bedroom with dunk beds, a small room with the washing machine. Both the double bedroom have an independent entrance from the garden. On the second floor, two bedrooms with two ensuite bathrooms and air condition. On the third floor, a large dinning room with kitcken and 1 bathroom and air condition too.Panoramic terrace and independent inside and outside entrances. The villa is provided with satellite TV, DVD player, washing machine, dishwasher, oven. USB key Internet Connection. Outside there is a barbecue, deck chairs and sun umbrella by the pool, outdoor tables to dine outside, jacuzzi, a lake with carpe koi fish and 3 small donkeys. The swimming pool is sanitized by salt, not chlorine or other additives. Parking area. Grocery shop, bank, pharmacy, restaurant, bus stop are in the closest town at about 1.5 km. The closest railway station is 2.5 km away. Riding stables in about 4 km and spa centre in about 18 km.